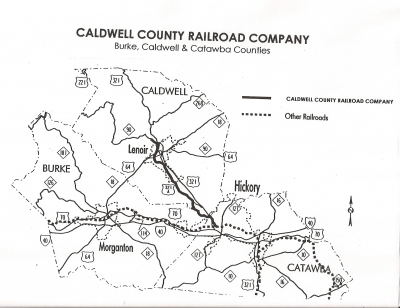 The Caldwell County Railroad Co. operates between Hickory and Lenoir, serving businesses in Catawba and Caldwell counties in North Carolina ’s Western Piedmont . The railroad began service in 1994 over a former Norfolk Southern branch line that was purchased by the Caldwell County Economic Development Commission. It was subsequently leased to Caldwell County Railroad Company, a subsidiary of Southeast Shortlines Inc. Commodities carried by the railroad are plastics and building materials. Principal shippers are: Sealed Air Corporation of Hudson & Lenoir and Pactiv of Granite Falls – both manufacturers of protective packaging materials; and Shurtape Technologies Inc. of Hudson – manufacturer of packaging tape. Available along the railway are many industrial sites, some with existing structures and rail spurs in place, close to U.S. highways 321 and I-40. The Caldwell County Railroad connects with Norfolk Southern at Hickory.